Flagstar Bank customers who didn't receive a debit card in the mail can go into any branch and receive a temporary one that will be replaced by a permanent one in one or two business days. Flagstar debit cards are accepted by Flagstar ATMs and any ATM on the AllPoint and Presto! ATM networks. AllPoint machines are found locally in CVS, Walgreens and Target stores. Answers to frequently asked questions regarding the customer transition are available at www.flagstar.com/welcomewells. 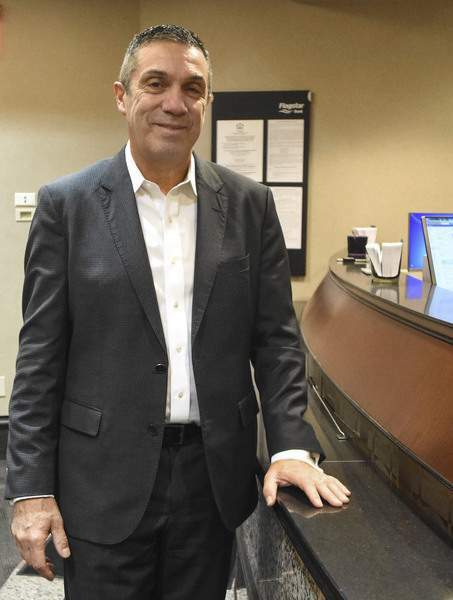 Flagstar Bank CEO Alessandro DiNello was in Fort Wayne on Wednesday to reassure new customers that their money is safe and officials are doing everything they can, as fast as they can, to address lingering issues. The transition of 150,000 former Wells Fargo customers to Flagstar last weekend went smoothly, he said, right up until Monday morning, when Flagstar's website went down, cutting off access to online banking. When they couldn't access their accounts online, people called the Michigan-based bank's customer service line, which swamped its beefed-up call center. Frustrated, some gave up and went directly to branches for help, he said. A call placed by The Journal Gazette to the Flagstar customer service line at 6:22 p.m. Tuesday resulted in a 30-minute wait until an employee came on the line to offer assistance. DiNello estimated that “several thousand people” were helped through one means or another those first two days. Flagstar's acquisition included $2.3 billion in deposits and $130 million in loans. Wells Fargo held onto its commercial lending, wealth management, retail brokerage and home mortgage relationships in those markets, where employees will work in offices smaller than typical branches. Banking officials expect some problems with every acquisition, DiNello said. Some customers neglect to notify their bank when they move, so they wouldn't have received notices of the upcoming ownership change from Wells Fargo or new checks and debit cards from Flagstar. About 2,000 mailings with checks and debit cards had been returned to Flagstar by the post office as of Saturday, and more continue to rebound each day, he said. Other customers received mailings outlining the transition steps but didn't realize the papers were important so didn't read them. Those who did had ample time to plan ahead before they lost access to accounts last weekend, DiNello said. “I'm very confident that we did everything possible to notify people,” he added. DiNello estimated that 90 percent or more of the former Wells Fargo customers experienced no problems in the transition. His mission now is to focus on those who weren't so lucky. The Rev. Jeff Lawson, pastor of Hopewell United Brethren Church, was among those still trying to sort out his banking Wednesday. Lawson read the banks' notices and followed their instructions. Because account balances were scheduled to transfer from Wells Fargo to Flagstar on Dec. 1, he went online and paid all his December bills the evening of Nov. 29. Typically, those payments would be processed the following day, Nov. 30. For some reason that Lawson doesn't understand, that didn't happen. He received an email last weekend from Wells Fargo saying that by the time they processed the payments, his account was empty – already transferred. That's on top of the fact that when the Lawsons' checks arrived for their joint checking account, only his name was printed on them. “It's not the end of the world, but it's an inconvenience,” he said about the checks. Because of the online banking snag, Lawson is paying his bills “the old-fashioned way” this month by mailing checks with account numbers written in the memo section. And he's already opened a checking account at competitor PNC. He plans to close his Flagstar account next week, the final move after making numerous attempts to navigate its website and making three separate trips to a branch. As a Christian, Lawson doesn't hold a grudge against Flagstar. But, Lawson said, he doesn't trust Flagstar with the money God has blessed his family with. Flagstar officials are trying to make peace with upset customers. They are waiving all fees for the new customers, including overdraft charges, until the bank returns to what DiNello described as “a normal state.” That could take until the end of this week, he said, although he was reluctant to put a time frame on the recovery. Although the CEO isn't ready to reflect on what went wrong, bank officials will investigate the situation when the dust settles. The deal included 52 total Wells Fargo locations – 33 in Indiana, 14 in Michigan's Upper Peninsula, four in Wisconsin and one in Ohio – and almost 500 employees, who have all been offered jobs with Flagstar. The 11 Fort Wayne branches included more than 75,000 accounts, representing a little more than 46,000 customers. As of June 30, more than $1 of every $4 in an Allen County bank – or $1.83 billion – was on deposit at Wells Fargo, according to FDIC data. That was the most of any bank in the local market. “I don't think scale was the issue,” DiNello replied when asked whether the bank bit off more than it could chew. DiNello isn't assuming the added influx of new customers on Flagstar's website was responsible. “Maybe that would have happened anyway, I just don't know,” he said. Six months of planning went into the transition, which followed a successful Flagstar acquisition of eight branches from East West Bank in California earlier this year. Flagstar contracted with Cisco and Oracle, firms that brought in more than 100 individuals, to increase its computer capacity, DiNello said. The bank also contracted with Kelly Services to bring in additional call center workers – even before problems occurred. “We will figure out what caused the situation, and if it was poor decision-making, we'll take appropriate action,” he said.